Size of this preview: 798 × 600 pixels. Other resolutions: 319 × 240 pixels | 639 × 480 pixels | 1,022 × 768 pixels | 1,280 × 962 pixels | 2,166 × 1,628 pixels. 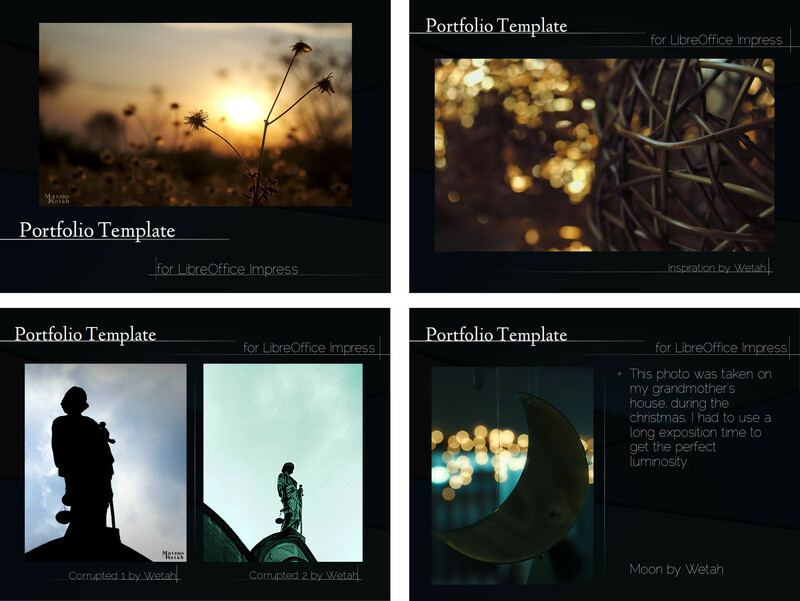 A low-res preview of the four master slides for the Portfolio Template for LibreOffice Impress. The photos are on CC. current 2012-05-29T01:28:53 2,166 × 1,628 (470 KB) Mateus.m.luna (talk | contribs) A low-res preview of the four master slides for the Portfolio Template for LibreOffice Impress. The photos are on CC. This page was last edited 01:28:53, 2012-05-29 by Mateus Machado Luna.